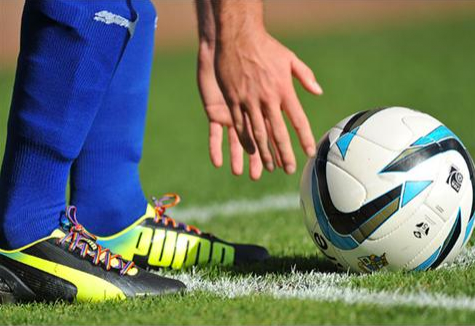 A number of both current and former Coventry City players wore rainbow coloured laces in a bid to raise awareness of, and tackle homophobia in football over the weekend. Last week, Stonewall and Paddy Power sent the laces to all professional clubs in England and Scotland, hoping to raise awareness of homophobia in football. However the campaign has been shrouded in controversy after many clubs left it up to the players to decide whether to use the laces after stating they were not consulted. Many clubs were also unhappy at Paddy Power’s involvement in the campaign; having been accused of mocking players in a previous advertising campaign, with only Premier League side Everton, whom Paddy Power are one of the club’s sponsors, enforced all of their players to wear the coloured laces. In City’s 3-2 loss at Port Vale, current Sky Blues Carl Baker, Blair Adams and Andy Webster all adorned their boots with the campaign’s laces. For Port Vale, the laces were also worn by former City midfielder Chris Birchall, who scored Vale’s winner after coming on as a half time substitute as well as a number of their players without City connections. In this afternoon’s Premier League game between Cardiff City and Tottenham Hotspur, Aron Gunnarsson also laced up in rainbow colours. « Micky Adams to undergo hip surgery.